EDINBURGH, Scotland, 2018-Jul-25 — /Travel PR News/ — A new film with a retro video-game twist will inspire families and young people to explore Midlothian and the Scottish Borders, according to VisitScotland. Game On! 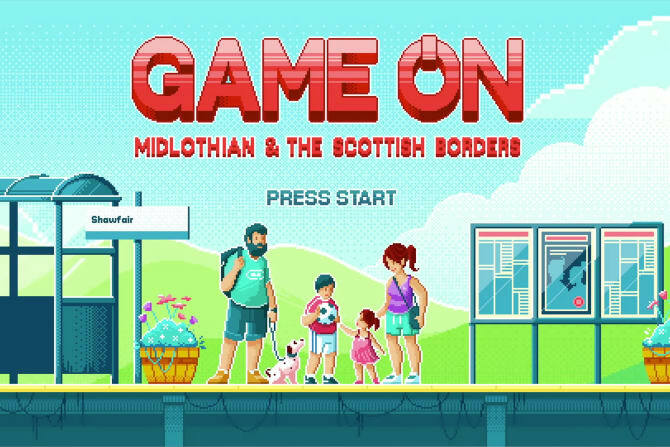 Midlothian and the Scottish Borders, a collaborative content project between the two regions, takes visitors on a journey through some of the top attractions and activities in both areas while playing on the familiar conventions of many classic games. The project was delivered by the national tourism organisation as part of their marketing activity with Midlothian and Scottish Borders Councils. Developed by Whitespace and filmed by HeeHaw productions, the video features the likes of Midlothian Snowsports Centre, Rosslyn Chapel, 7stanes Glentress and Born in the Borders. These attractions are accompanied by point-of-view shots, collectable trinkets and the iconic 8-bit music synonymous with games like Super Mario Bros and Zelda. VisitScotland have also produced a supporting blog which features the film and details 25 activities for families and young people across the two regions. The national tourism organisation believes this innovative and engaging content will encourage visitors to choose Midlothian and the Scottish Borders for their next Scottish break or day out. The project is particularly apt as Scotland celebrates the Year of Young People 2018. The latest of the Scottish Government’s series of themed years, it looks to inspire Scotland through its young people aged 8 to 26, celebrating their achievements, valuing their contributions to communities and creating new opportunities for them to shine locally, nationally and globally. This entry was posted in Entertainment, Tourism, Travel, Travelers and tagged families, film, Mark Rowley, Midlothian, Neil Christison, Russell Imrie, Scotland, Scottish Borders, video, VisitScotland, young people. Bookmark the permalink.